Welcome to part 2 of my beginners guide to a very British Christmas. Click here to read part 1. In Britain, decorating your home for Christmas is called “putting the tree up” and the date on which you do this is hotly debated among us Brits. Traditionalists tend to favour the 12 Days rule whereby you decorate your home 12 days before Christmas (i.e. 13th December) and take it all down again 12 days after Christmas (i.e. 6th January). Others (myself included) like to jump into the season headfirst and deck the halls on the 1st December. Cause if you’re cracking open the Advent Calendar on this date, you may as well get the tinsel out too. However, the one thing you must remember when celebrating Christmas in Britain is to never, EVER, under any circumstances, decorate your home before 1st December. The shops and towns can do it, but you cannot. If you do, you will be ridiculed (behind your back of course, we are British after all). Nothing thrills us Brits more than to pass by someones home in November, get a glimpse of the decorations inside, and spend the subsequent weeks loudly telling people about that “eejit in our street with his decks up”. You have been warned. 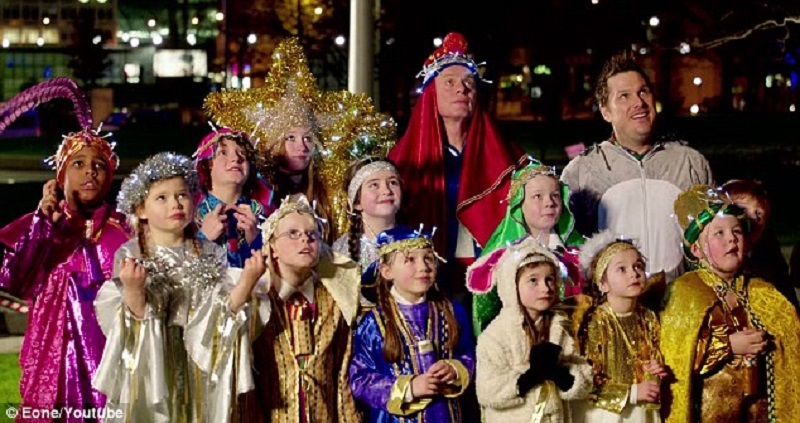 You’ll be hard pushed to find a British primary school who doesn’t put on their own production of the nativity play in December, but the format is always the same. Kids will play the characters (although Baby J will just be a creepy looking doll) and that one teacher whose a dab hand on the piano will bang out the tunes. Parents and Grandparents will all turn out to coo over their kids and suffer the mind-numbing tuneless singing. If you’re lucky, there might even be a tepid plastic cup of wine thrown in. Now back in my day the costumes were handmade: a tea towel on your head, your old bathrobe, and a tatty pair of sandals and you’re a shepherd; tinsel round a coat hanger over your head and you’re a fairy; sweets glued onto a paper crown and boom, you’re a Wise Man. Nowadays nativities appear to have lost their quaint appeal and gotten a lot more serious, and costumes are no longer handmade but shop-bought. But don’t worry, you don’t actually need to attend one of these unless you have a child starring in one. One thing you need to understand about us Brits around Christmastime is that we’re sickeningly nostalgic and we long for a Dickension-style white Christmas. 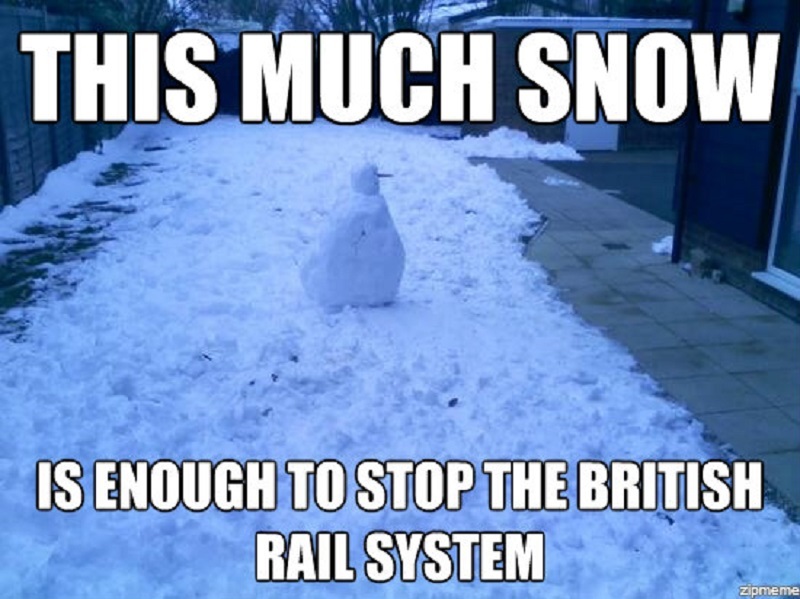 But equally, we love to complain about the weather so when it does snow, we love to moan about it. Which is doubly great because in Britain when it snows, the whole bleeding country grinds to a halt: So have more things to complain about. You’d think that since we’re on the same latitude as Moscow and Alaska, Britain would be able to deal with this kinda weather? Well we’re not. There’s never enough salt for the road, school heating systems shut down meaning parents have to take time off work, and the threat of “black ice” on the roads is a frightening prospect for us all. And all this over an inch of snow and a temperature of -3C. 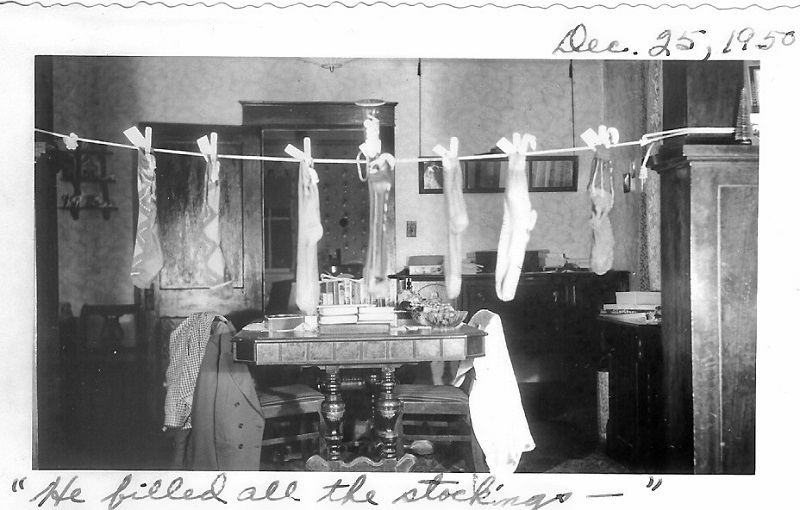 It’s tradition in Britain to hang your stocking, on Christmas Eve, at the end of your bed. Which worked great during Victorian times when we had those big brass beds to hang stuff from. You know the kind from Bedknobs & Broomsticks? This effectively meant that British families used to go to bed on Christmas Eve in the full and accepting knowledge that a bearded stranger would be creeping into their bedroom in the middle of the night. In recent years, we’ve adopted the somewhat less creepy custom from our American cousins, of hanging our stockings over the fireplace. Now in Britain, we don’t all have fireplaces so in some families we make do with hanging these from a bookcase or tacked into a wall. We’ve also upgraded to fancy personalised Christmas stockings rather than our Dad’s old hill-walking sock. What is placed in these stockings can vary. Traditionally it would have been a Clementine which in recent years has been replaced with less Puritan-feeling Terry’s Chocolate Orange. If you’ve been bad, you received a lump of coal and this was what your parents threatened you with from October – December. 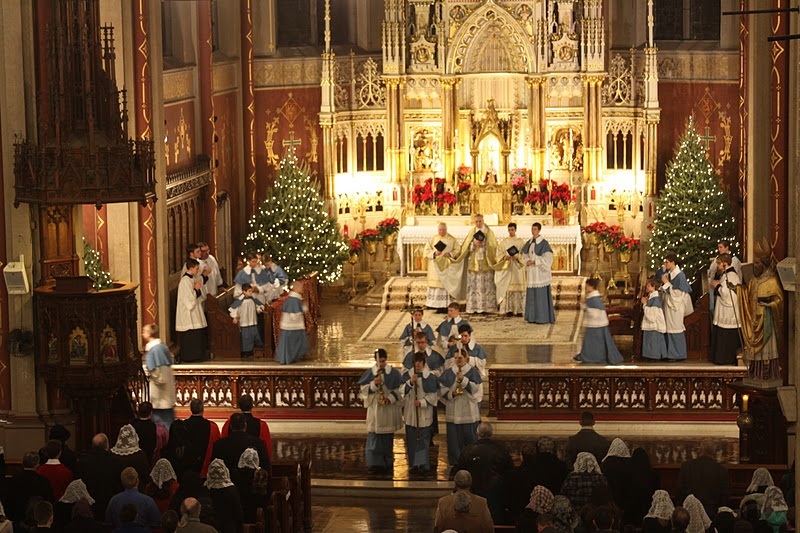 In the UK, midnight mass is a Catholic church service held on Christmas Eve. Despite the name, this midnight mass can be held anytime from 8pm to midnight. The Protestant version is typically called the Watchnight Service and has all the good bits of midnight mass (carols, candles, Christmas spirit etc) but with none of the overt religious paraphernalia. Some churches, mainly the Protestant ones in my experience, even serve mulled wine & mince pies. So if you do fancy attending a service, select your service wisely. Growing up a Catholic and attending Catholic schools, going to mass was just par for the course and something I just suffered in silence. But attending Midnight Mass was massive fun in comparison. 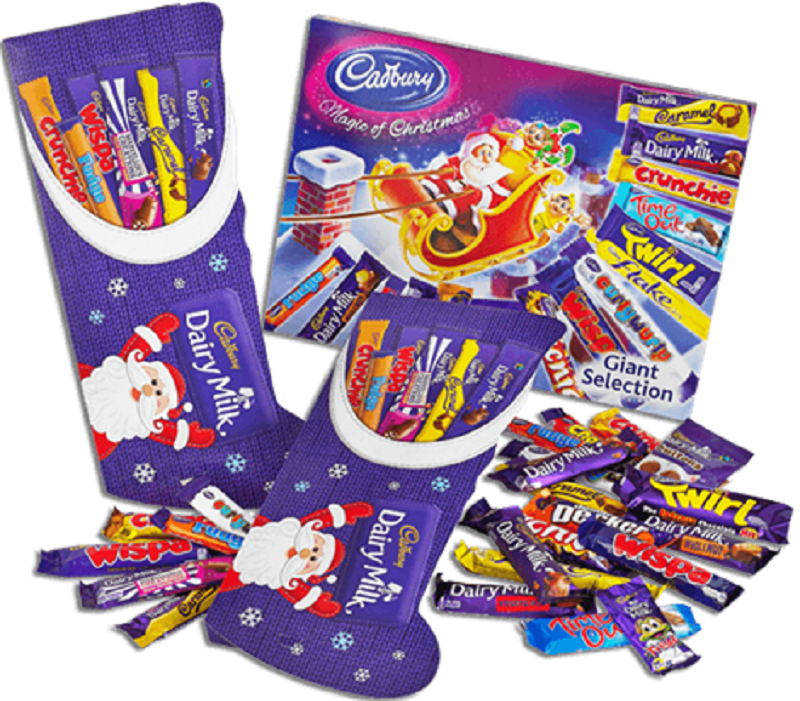 I’d got to stay up late, go out into the fresh snow in the dark, see some of my pals from School, sing Christmas carols and nab a selection box from Santa at the end (our church may have been progressive or they knew how to get punters through the door). Selection Boxes are an assortment of chocolate bars presented in a large plastic tray and are, in my humble y opinion, a ubiquitous part of a British Christmas. If you want to have a truly British Christmas, then your Christmas morning should involve opening presents in your pyjamas, surrounded by piles of wrapping paper, while eating your way through multiple selection boxes: regardless of how early it is or whether you’ve had a proper breakfast. Christmas Day is not the time when British parents worry about their kids dental health or whether they eat a nutritious meal. And by this I refer to the British television viewing schedule over the Christmas period, which let me tell you right now, is gold. Truly, Christmas telly has got to be one of our best exports? Christmas begins to infiltrate our televisions from late November to early December. We have the Christmas adverts where every supermarket and retailer in the land will try to outdo one another (John Lewis’ typically bags the top prize). Then the Christmas movies begin to creep in. However British Christmas TV shows are exceedingly top notch. Every year I watch the same stuff and every year I love them a little more. Fanny Craddock’s Christmas, Only Fools and Horses, Gavin and Stacey, Blackadder, The Snowman, and Father Ted: I love em all. I’m only sad that we no longer have the Downton Abbey Christmas special to look forward to anymore. 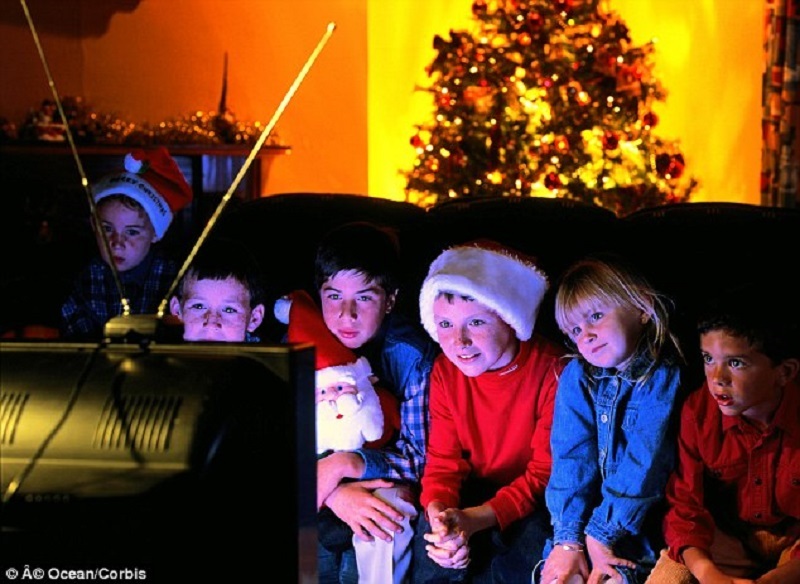 Now on Christmas Day, in Britain, the telly should be on all Christmas morning. This is when you’ll have the classic cartoons of The Snowman and Father Christmas to open your presents to. Mid-morning to early afternoon, you might even squeeze in a movie. But remember the telly is pretty much background entertainment: The family will be too busy arguing, cooking, playing with toys etc. to fully pay attention to the tv so don;t get annoyed if you can’t hear what’s going on. The telly will go off during lunch, but the Queen’s Speech around 3pm will typically get a look in depending on how Royalist the family is. Come 7pm us Brit’s are on the sofa, wearing a wonky paper crown, with a drink in our hand. We’ve probably just finished a family game of Trivial Pursuit or Monopoly and hankering for some ‘nibblies’. This is when the cheese, crackers, cold cuts etc will get brought out and its the perfect time for a classic movie like Its a Wonderful Life or Home Alone.